This is the recipe I always used for St. Patrick’s Day. 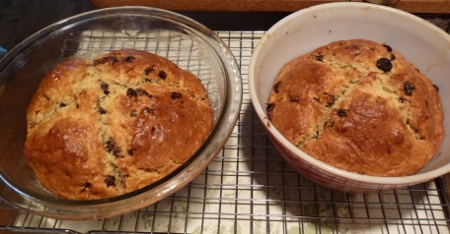 Usually I make one big round loaf using my largest pyrex bowl from the set of three. I made two loaves with the full recipe. This time though I decided to make two smaller loaves so I could share one with my friend Ann Marie, shh, it’s a surprise! 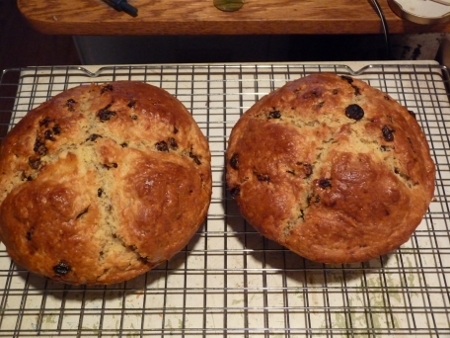 The two loaves cooling, gosh the house smelled wonderful! After 10 minutes cooling, you can take the bread out of the bowls to finish. If you can resist, it tastes best the day after you make it. Let it cool totally, wrap up tightly the RESIST! Well I usually can’t do that…resist that is, so I have a nice slice after dinner with coffee. Well you do have to test it to make sure it’s good enough for everyone right? 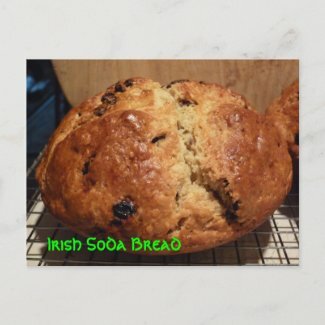 Irish Soda Bread – Makes one big loaf or two smaller ones. Directions also follow for mixing it up for jar mixes. Preheat oven 375 F and grease your bowl(s). 1. Put your sifter into or over a bowl then put in it- flour, sugar, salt and baking powder, baking soda, then sift into bowl. 2. Cut in butter with pastry blender until like course crumbs, rub in with fingers if you need to also. 3. 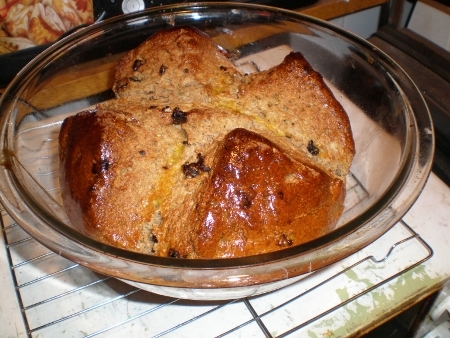 Mix in caraway seeds and raisins. 4. Combine the milk, egg and baking soda and mix well. I measure the milk into a large liquid measuring cup then add the other things to it. 5. Stir into the flour mixture, mix with fork first then use bowl scraper or big rubber spatula. 6. Turn dough onto floured surface, I do it right on my counter top. Knead lightly until smooth, really hardly at all, just to form a ball shape, dough will be soft. Shape into a ball then spray a pyrex bowl (the large one of a set of three) with spray vegetable oil. OR divide dough in two and put each in medium sized bowl. 7. Put dough in and cut a deep cross or X into it with a knife, (to release the fairies!) gently push it apart so it’s slightly open. Take one egg yolk and brush (or use fingers) on top and into cracks. 8. Bake one hour, (for two smaller loaves bake 50 minutes) cool in bowl 10 min. then remove to finish cooling. This tastes best the next day, if you can resist! Wrap well and store in ziplock bag as you use it up. Full sized loaf of whole wheat soda bread I made another time using this recipe. ** Another version: 1/2 golden raisins, 1/2 regular raisins, no caraway seeds, 1 1/2 c white whole wheat flour, 2 c regular flour, 1/2 c oatmeal. ** Another version I tried: leave out the raisins and seeds, cut sugar to 1/8 c, use 2 c whole wheat flour, 2 c white whole wheat flour, add a bit more of the baking soda, I added a LOT of Italian seasoning and parsley, some basil this was good, but I also added dried cut up tomato and this was ok, wouldn’t add next time, but mine were quite dry. ** The original recipe has you add the baking soda with the milk and egg, then add it all at once to the dry mixture. I found no difference really by adding it with the dry ingredients, the mix the egg and milk and add. 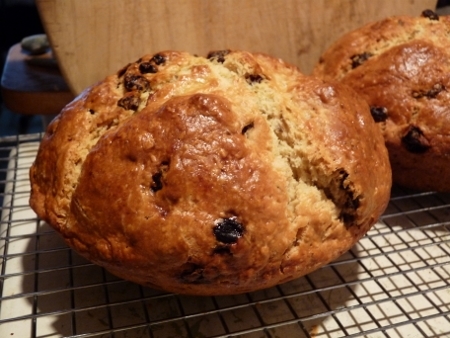 Just have your oven ready because with soda breads and scones you want to get them into the oven right away. ** For putting into jars to mix small loaf when you want it. I love doing this with recipes because I’m only baking for one or two and this way I can make smaller amounts and have it ready quicker! 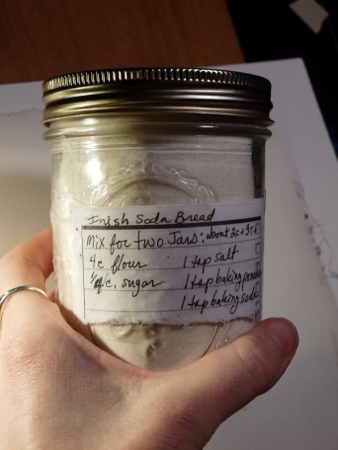 Write out instructions on a small paper, tape to the jar. 2. Divide between two (2 c) mason jars, about 2 c + 3-4T each or divide putting some in a jar and some into a bowl to make into bread right away. 3. Put these instructions on the jar (cover the paper with wide clear tape totally and it will last longer): To make put contents into bowl. 4. Cut in 2 T (1/4 stick) softened butter, then rub in till like crumbs. 6. Mix 1/2 an egg with 5 1/2 oz OR 1/2c + 3 1/2 T of Buttermilk (or add 2 tsp. vinegar or lemon juice to milk) Mix in with flour with fork then use bowl scraper to get into a dough. Put on floured cupboard and lightly knead into a ball. Put in greased Med. Bowl cut X in top and brush with remaining egg. Bake 375 for 50 min. I also add the dry ingredients list to make new batches on the back side. 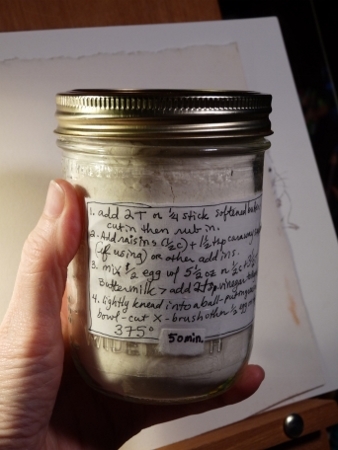 I also put the dry ingredients list on the jar so I can easily make new batches and refill. 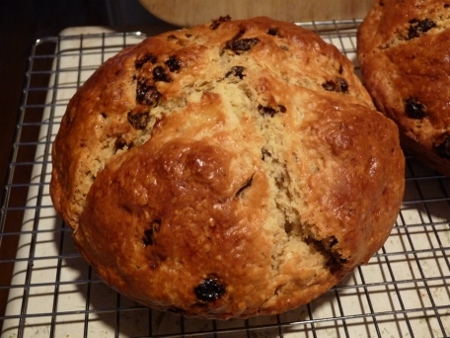 Try all kinds of variations with your soda bread. Decrease sugar if making a savoury bread for dinner. Enjoy baking and let me know if you try this bread!